The wait is over – the HTC Incredible is here! If you are pining for the fjords a Google Nexus One on Verizon, grab this instead – you are getting a better device. All the tasty Nexus One goodness remains – Android 2.1, the 3.7″ 800×480 capacitive OLED screen, the 1 GHz Qualcomm Snapdragon CPU, and the thin design. I snapped some lovely shots with the Incredible this evening, and low-light performance is great. There’s still no dedicated camera key, but there’s touch-to-focus. Thanks to the friendly people at Verizon for the review unit. Does it have dual microphones with the dedicated noise reduction chip? (this has worked very well for me) Does it have the 512MB of RAM? Does it have quad band GSM so when I travel abroad I can pop in a SIM card? Have seen conflicting opinions on the quality of the signal on the Incredible when compared to the Droid from Motorola. How has the signal been for your use? Sorry, I no longer have a Droid review unit to compare with, but so far signal quality has been excellent. What do you think will be more of a monster, the Incredible or the EVO? The EVO, obviously – same camera, better video recording, bigger screen (4.3″), 4G. Actually, the EVO does not have the same camera, it has the same megapixels. The EVO is capable of HD 720p, the Incredible is not. Great unboxing and description. I dig that industrial design, as well, and I noticed that the speakers on on the recessed portions, which means they won’t be muffled when you have it lying on the desk. I do wish that we could put whatever firmware on the device we wanted, to get rid of SenseUI and keep up with updates when Verizon lags behind. Then again, someone will likely make that possible. Can you install apps to the 8 GB memory and the Micro SD expansion memory? Or only to the 512mb RAM? Apps are never installed in RAM – RAM is volatile memory used by the OS and apps while running! That 8gb usable for apps makes this an amazing Android phone. Pretty much makes the Nexus One a non-issue for me. I’ve been fighting with the 192ish on the G1 for a while now. Thanks for this! Unboxing videos are always so compelling. The Droid Incredible, coupled with the HTC Evo and Galaxy S this summer will really push the envelope for cutting-edge smartphones this summer. Does it support just Gmail, or any POP3 mail account? It supports any kind of email, like all Android phones. You mentioned a follow-up post in your video, do you have a date in mind for that? I’m also wondering about your thoughts on its battery life (some complaints about that elsewhere) and durability for when it’s dropped. @Steve, my camera review should be up in the next few days. Battery life is a little worse than the Nexus One (Sense UI eats up more processor cycles) – basically, it’s a daily charger, but I can squeeze 2 days use out of one charge. I don’t drop test phones, but like any thin, modern, high-tech device with a large glass screen, the Incredible is best handled with care – no moving parts (like a keyboard) means a silicone case is an option. The Incredible is definitely one of the best phones currently on the market – it’s a powerhouse of hardware and software. 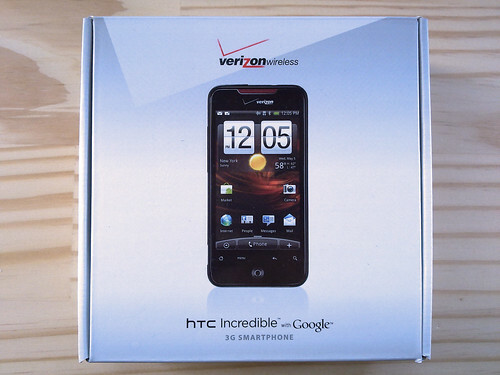 If Verizon send me a Droid X review unit and lets me keep the Droid Incredible review a bit longer, I’ll do that. Which do you prefer – Droid X or Incredible?? I just left ATT and my unlocked Nokia E71 – which was a great piece of hardware… now considering one of these units. Features that are key for me are quality of hardware and ‘pocketability’… Thanks!!! @Travis I think I like the Droid X better, but it’s a close call.